The Sigma 20mm 1.4 DG HSM Art is a state of the art wide-angle prime lens designed for Full Frame cameras but will work with APS-C sensors as well. The latest optical design allows for the utmost in image quality with careful attention paid to edge to edge performance. Through decades of experience in lens design and Sigma Global Vision lens manufacturing, the 20mm incorporates both "F" Low Dispersion (FLD) glass, and five Special Low Dispersion (SLD) glass in a design of 15 elements in 11 groups. The combination of advanced optics and optimized lens power distribution minimizes spherical aberration, axial chromatic aberration and field curvature, producing outstanding image quality. With class leading performance, this lens is ideal for landscape photography, videography, astrophotography, lowlight/indoor photography and event photography. As with all Global Vision lines, the 20mm will be tested using the proprietary "A1" measuring system ensuring the highest standard of operation. The Sigma 20mm Art is compatible with the USB dock to update and customize and is also compatible with the Mount Conversion Service. A staple procedure for the Global Vision lines, every lens will be tested using the proprietary "A1" measuring system. SIGMA has extensive experience in leveraging its advanced design capabilities and leading-edge technologies to craft large-aperture prime lenses that bring out the full potential of ultra-high-megapixel DSLRs. As its latest achievement in this category, SIGMA has created an ultra-wide-angle lens with F1.4 brightness. With a focal length of 20mm and F1.4 aperture, this lens delivers outstanding large-aperture brightness and bokeh, delivering unprecedented visual experiences. Allowing the photographer to leverage the perspective provided by the wide-angle and the shallow depth of field provided by the large aperture, this lens is ideal not only for such ultra-wide-angle subjects as landscapes and starry skies, but also for snapshots in low light, indoor photography, portraits with a natural bokeh effect, and much more. SIGMA is organizing all its interchangeable lenses into three product lines: Contemporary, Art, and Sports, each with a distinctive concept. Designed with a focus on sophisticated optical performance and abundant expressive power, our Art line lenses deliver high-level artistic expression. Offering astonishing rendering performance that meets the highest standard, they are perfect for landscapes, portraits, still-lifes, close-ups, and casual snaps. They are made for the kind of photography that unleashes the inner artist. A powerful ally in every genre of photography, SIGMA?s Art line lenses excel both in the studio for formal works and outdoors for impressive shots of architecture, starry skies, and many other scenes. To offer an ultra-wide-angle 20mm focal length and F1.4 brightness at wide-open aperture, this lens incorporates a large double aspherical lens 59mm in diameter. 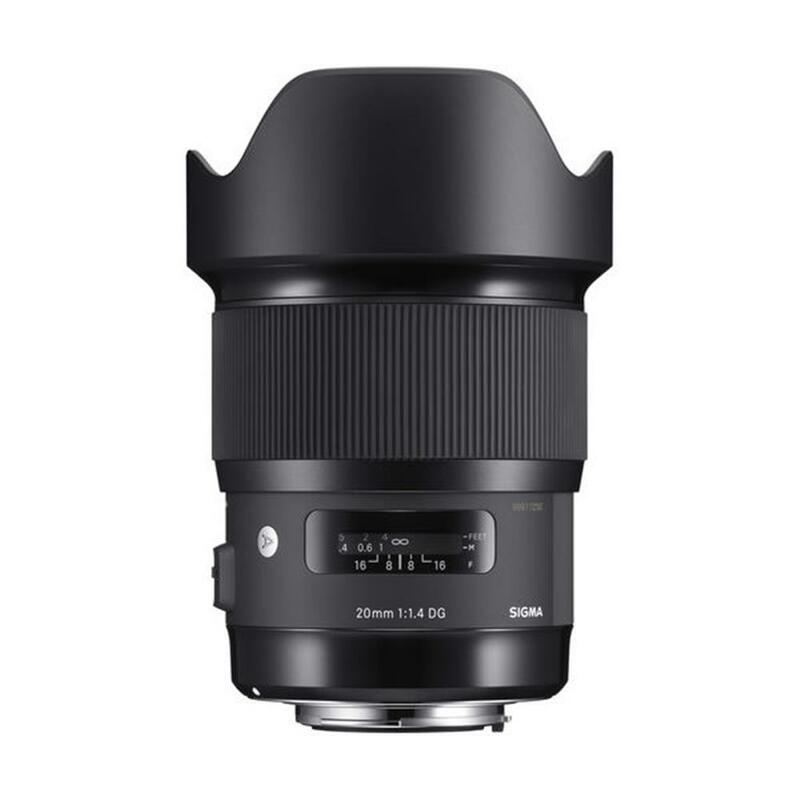 Lenses of this type had been considered extremely difficult to manufacture, but SIGMA took on the challenge to realize an F1.4 ultra-wide-angle lens that fulfills the strict performance requirements of the SIGMA Art line. What made this breakthrough possible were SIGMA's advanced manufacturing technologies, which the company has developed over time by producing a wide range of ultra-wide-angle and large-aperture lenses. For example, milestone lenses such as SIGMA 12-24mm F4.5-5.6 EX DG ASPHERICAL HSM, SIGMA 8-16mm F4.5-5.6 DC HSM, and SIGMA 18-35mm F1.8 DC HSM | Art were completely original products that helped SIGMA develop outstanding design and production know-how and its current high-precision, high-efficiency production system. In turn, these advances made possible the SIGMA 20mm F1.4 DG HSM | Art. Moreover, SIGMA's advanced optical design minimizes distortion, transverse chromatic aberration, sagittal coma flare, and the reduction of brightness toward the edges of the image. Delivering top performance even at wide-open aperture, this lens can be considered the culmination of SIGMA's Art line. This lens minimizes chromatic aberrations, a common issue in large-aperture ultra-wide-angle lenses. It features two FLD (?F? Low Dispersion)* glass and five SLD (Special Low Dispersion) glass elements to minimize transverse chromatic aberration, which is mainly visible around the edge of the image. The optimized lens power distribution helps minimize axial chromatic aberration. As a result, this lens delivers high image quality in every situation without color smearing, and its rendering performance is consistently sharp with high contrast. The degree to which light is refracted by glass depends on the light's wavelength. This fact causes different colors of light to focus at slightly different points. The result is chromatic aberration, the color fringing that is particularly noticeable in telephoto lenses. Most chromatic aberration can be removed by combining a high-refractivity convex lens element with a low-refractivity concave element. Yet residual chromatic aberration known as ?secondary spectrum? may still remain. To minimize this secondary spectrum, which can be a serious issue with conventional lenses, SIGMA lenses feature up to three types of exclusive low-dispersion glass offering superior performance: ELD (Extraordinary Low Dispersion), SLD (Special Low Dispersion) and FLD ("F" Low Dispersion). In particular, FLD glass offers ultra-low dispersion in combination with high transmittance and the anomalous dispersion characteristics of fluorite. Meticulous deployment of these types of exclusive low-dispersion glass and optimization of power distribution gives SIGMA lenses superlative image rendition undiminished by residual chromatic aberration. From an early stage in the lens design process, flare and ghosting have been measured to establish an optical design resistant to strong incident light sources such as backlighting. SIGMA's Super Multi-Layer Coating reduces flare and ghosting to help photographers produce sharp and high contrast images even in backlit conditions. A lens hood can be attached to block out extraneous light, which can have a negative effect on rendering performance. At the dawn of the film camera, there was very little high-sensitivity film, and bright lenses that worked well in low-light conditions came to be known as "high-speed lenses." These lenses are ideal for shooting indoors, in the evening, under cloudy skies, or in any low-light situation. Since the SIGMA 20mm F1.4 DG HSM | Art provides the benefits of an ultra-wide angle lens with minimal distortion, it is ideal for photographing landscapes, starry skies, and architecture. In addition to capturing wide-angle shots with the whole scene in focus, the photographer can leverage wide-open aperture to take snapshots with the subject in focus and the background blurred with an attractive bokeh effect. Designed for ultra-high-megapixel digital cameras, this high-performance lens delivers outstanding resolution and high-clarity image quality even at wide-open aperture.